Like me, I’m sure most of you are carving out time during the week between Christmas and New Years to plan for the coming year. It’s an exciting and favorite time for most of us. Not only for the visits of family and friends, but for the time to reflect on where we’ve been and where we’re going. Ever since discovering Your Time and Your Life (The Insight System for Planning, 10 Audio cassettes and Study Guide) in 1990 I’ve taken planning very seriously. 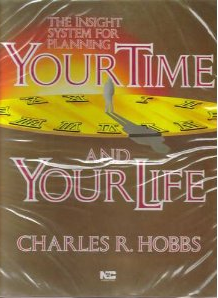 Hobbs says in this vintage tape series that it’s ironic and counterintuitive, but the time spent planning actually saves time. As the self-diagnosed poster child for Adult Attention Dyslexia, I am convinced that without my daily lists of tasks I can find myself Googling basket weaving and really thinking that I am doing something of value. For me, the ritual of annual goal setting is a sacred one. I usually start on Christmas Day. I like to make sure there’s plenty of coffee ready, then I lock myself away in my office. I used to do my goal planning session in one day, but I have begun recently to take more time. I have found shorter stretches of time work better for me, as I can come back and look at my work and make changes. I start with a review of all of my goal setting notes from previous years. I have my notes from as far back as 1990. I like to flip through them recalling where I was sitting in that year when I wrote them out. But most importantly, I like to see which goals I have reached and which ones I missed. There’s an insight I get from this exercise that has allowed me to improve year by year. It’s almost as if each year I’ve gotten better at realizing how far I can stretch myself. And I do stretch myself. For example, when I was 16 I was diagnosed with cancer of the spinal cord. The surgery left me with a long scar down my neck and fused bones in my spine – definitely not the kind of physical condition to run marathons. Yet, I’ve run two so far. When I actually get down to the actual planning I start by reviewing what Hobbs calls “Unifying Principles.” Essentially they are my values. What do I believe in? What are my redlines? What are my ideals? From there I develop Personal Goals. They include Physical, Spiritual, Social and Family Goals. I do personal goals before I do business goals. I learned from Michael Gerber of E-myth fame, that ultimately, everything we do in business is really for ourselves. How far we are willing to put ourselves out is rooted in, first and foremost, who we are personally. After these steps I get down to business goals. This is actually the part of goal planning that takes the most time because my Unifying Principles and Personal Goals are fairly static year to year. Too, because I wear more than one hat I must go through each position I hold and identify what I need to accomplish in the coming year.